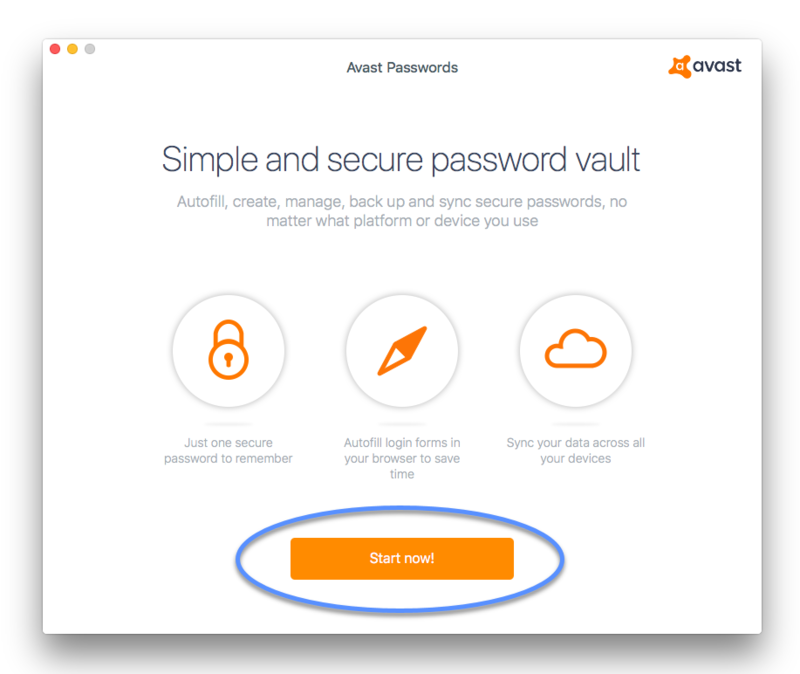 After installing and opening Avast Passwords, click Start now! to start configuration. Create a Master Password and retype it. 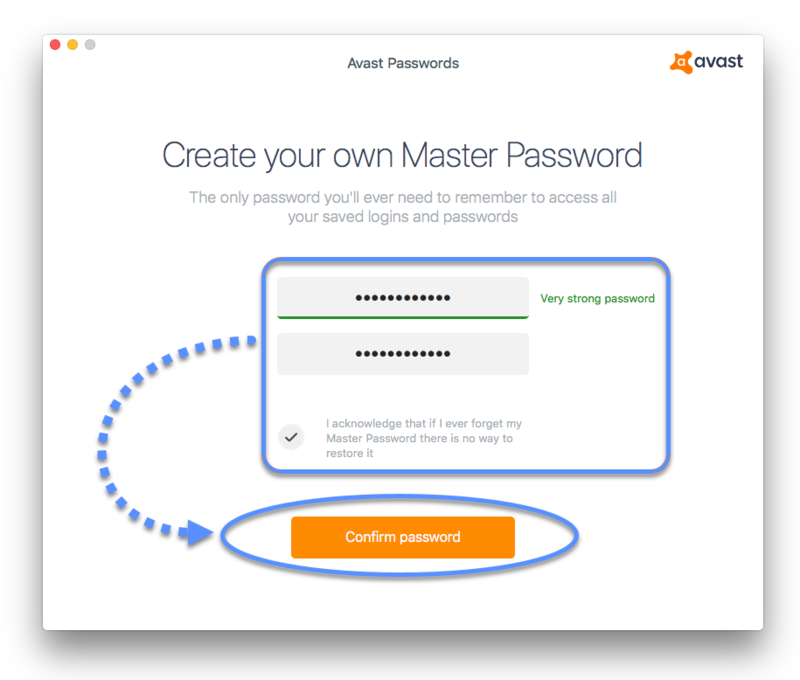 Tick the box to acknowledge that Avast is unable to restore or reset your Master Password if you forget it. Confirm your changes by tapping Confirm password. 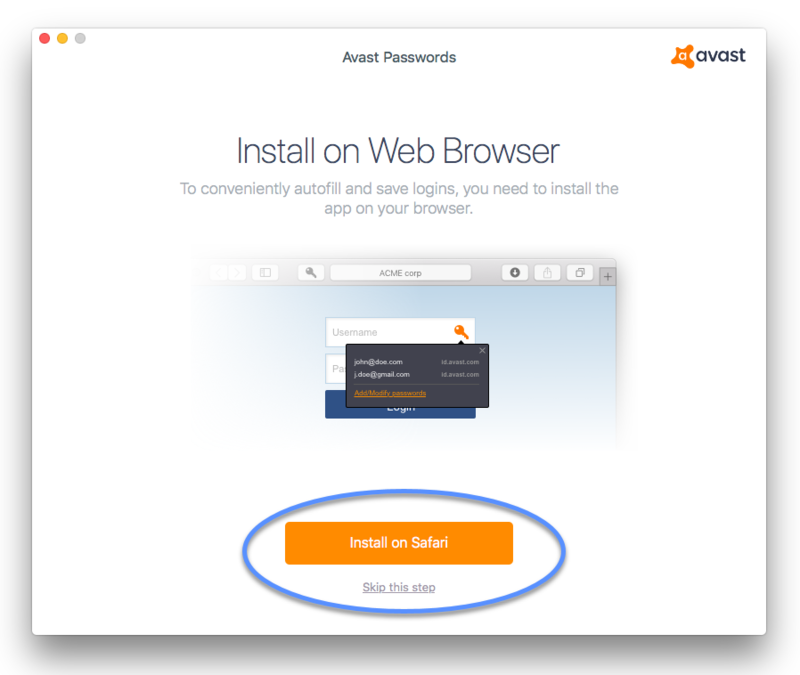 Click Install on Safari to install the Avast Passwords browser extension. Alternatively, click Skip this step. You can install or reinstall browser extensions later by going to the Preferences menu. Safari opens. Click Install now. When the installation completes, the Passwords icon is visible on the Safari menu bar. 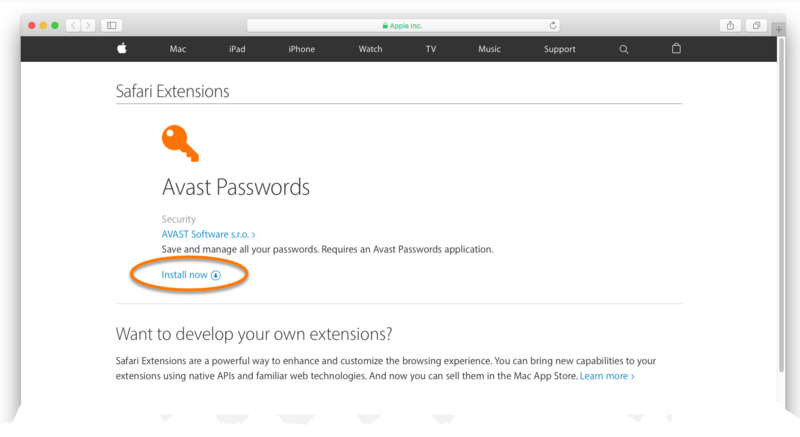 Refer to the section in this article for how to use the Passwords browser extension. 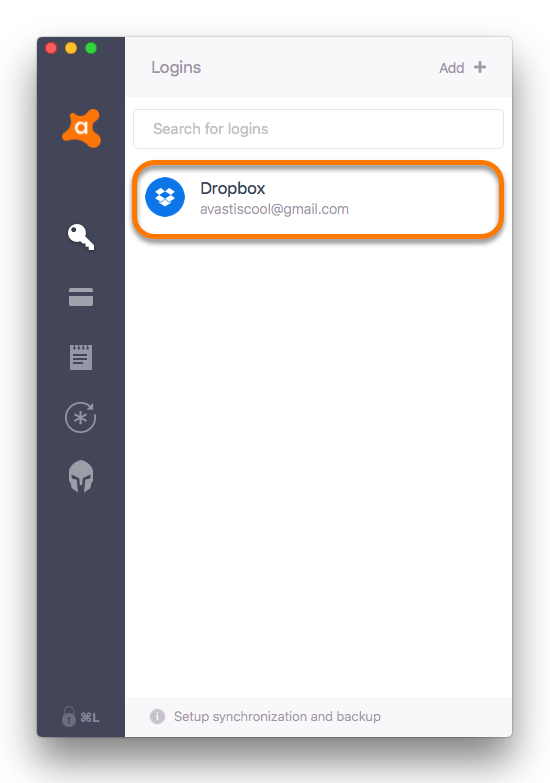 Return to the Passwords setup tutorial and select other browser or password manager icons to import your existing accounts and login data. Alternatively, click Skip this step. You can import your data later by going to the Preferences menu. Follow the on-screen instructions to import your data. Passwords that are imported are not automatically deleted from your browsers. We recommend you manually delete all passwords from your browsers. For more information, refer to your browser's documentation. Click the key icon on the left-side panel, then click Add +. Service name: a name that will allow you to easily find and recognize your account. URL: the website address of the account, for example, https://www.example.com. Note: any information related to this account. Click Save changes to confirm the data. A tile representing your newly added account details appears on the Logins screen. Click an account tile to open the account contents. 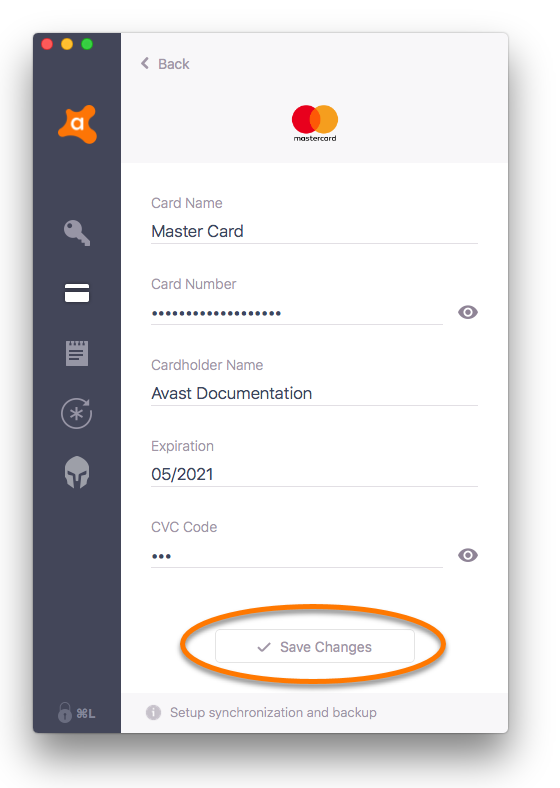 Edit an account: Click Edit, then modify the existing account details and click Save changes to confirm your changes. 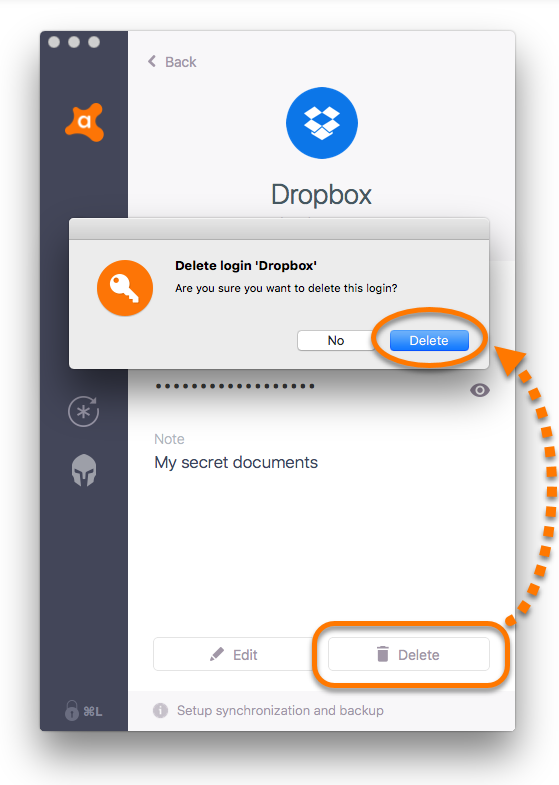 Delete an account: Click Delete to completely remove the account. Account details cannot be restored once you delete them. The Credit Cards section allows you to securely store your credit card details for faster online shopping. All credit card details are encrypted and protected by your Master Password to ensure maximum security. 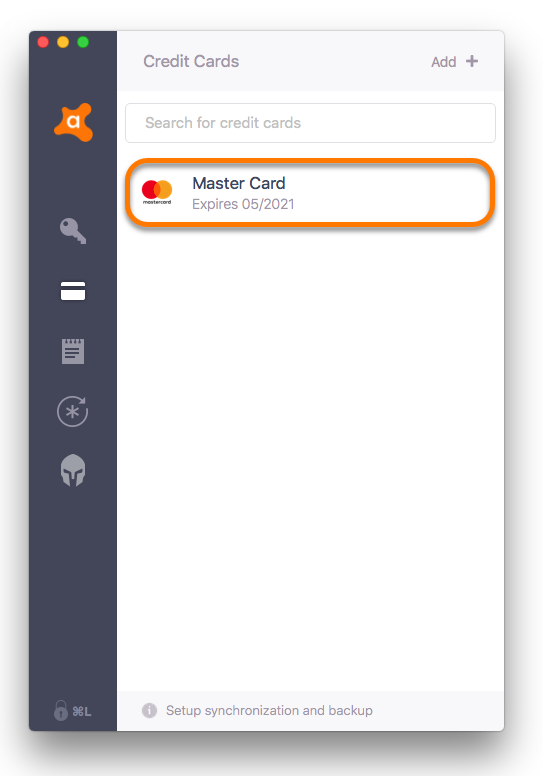 Click the credit card icon on the left-side panel, then click Add +. Card name: a name that will help you recognize this card. Cardholder name: your name as it is printed on your card. 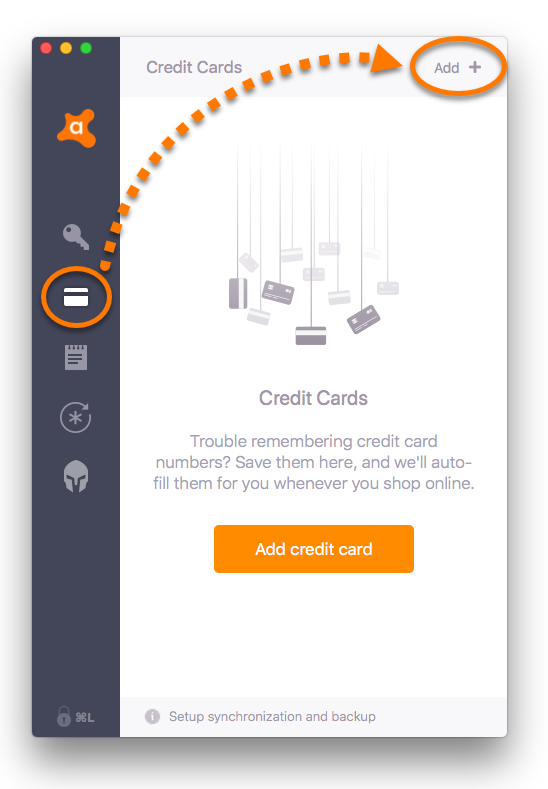 A tile representing your newly added card appears on the Credit Cards screen. Click a card tile to open the card contents. 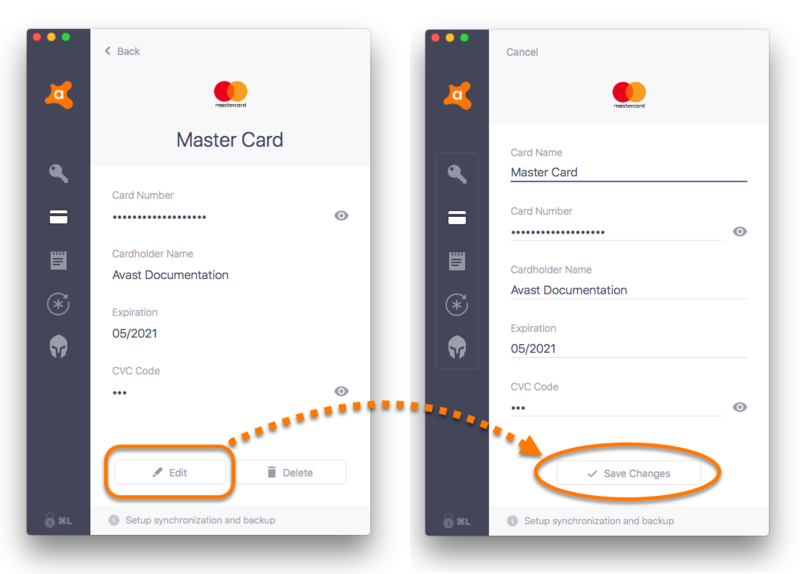 Edit a card: Click Edit, then modify the existing card details and click Save changes to confirm your changes. 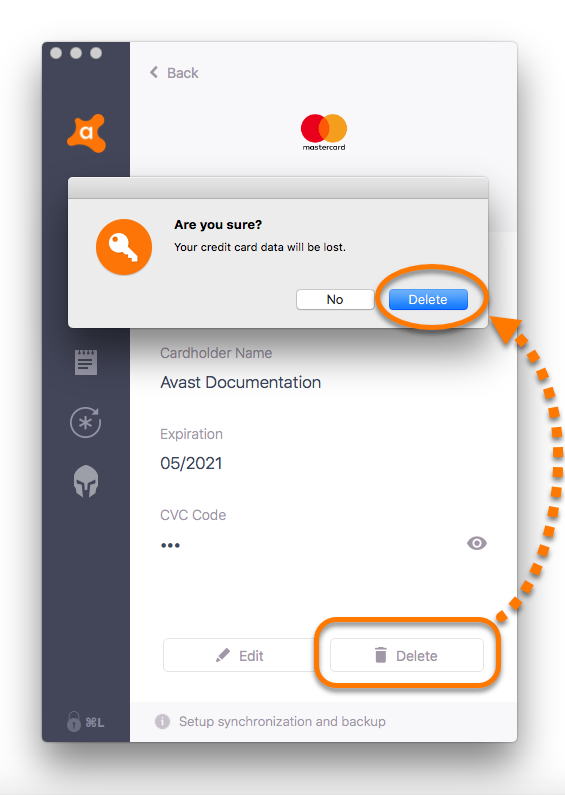 Delete a card: Click Delete to completely remove the card. Credit card details cannot be restored once you delete them. 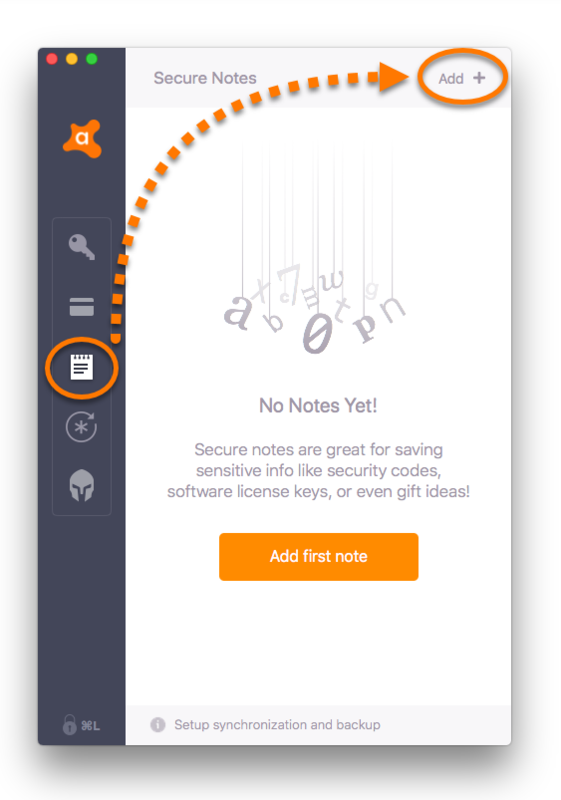 The Secure Notes section is a place where you can safely store sensitive data in Avast Passwords. This feature protects your confidential information from unauthorized access. Click the note icon on the left-side panel, then click Add +. Text: any data that you want to keep secure, such as PINs and contact details. 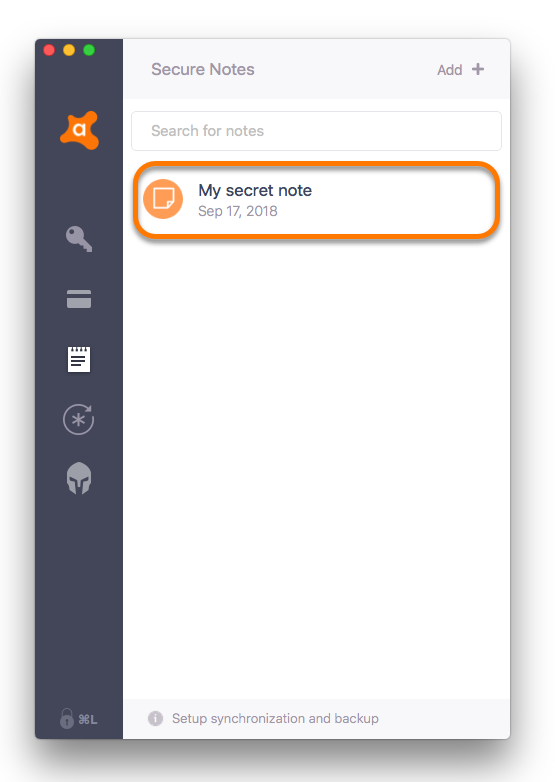 A tile representing your newly added note appears on the Secure Notes screen. Click a note tile to open the note contents. 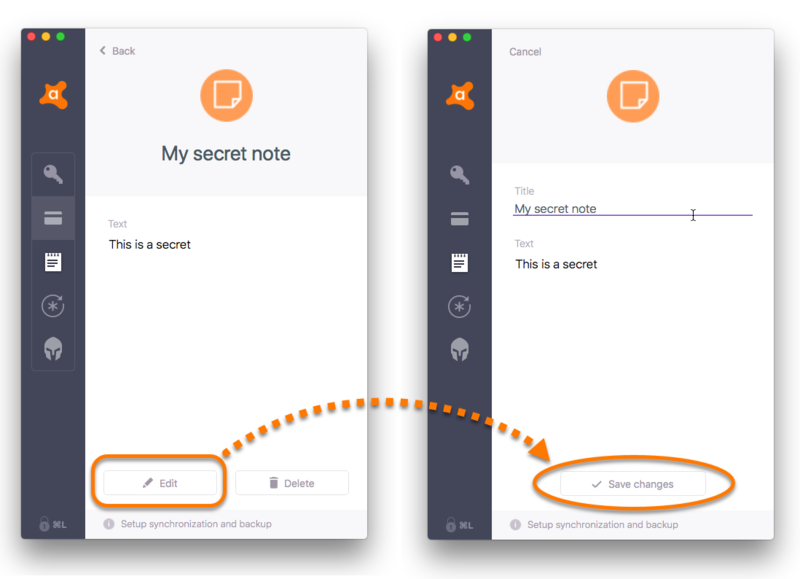 Edit a note: Click Edit, then modify the existing note and click Save changes to confirm your changes. 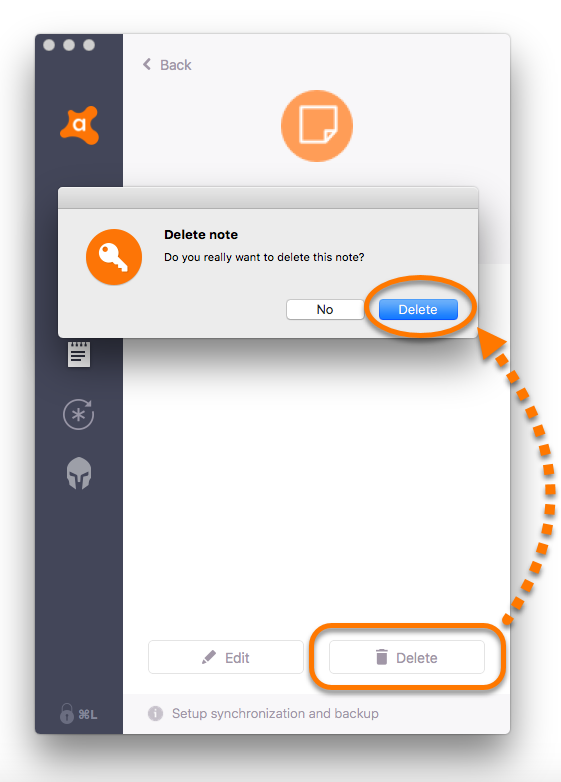 Delete a note: Click Delete to completely remove the note. Notes cannot be restored once you delete them. Avast Passwords can be used to generate safe passwords. 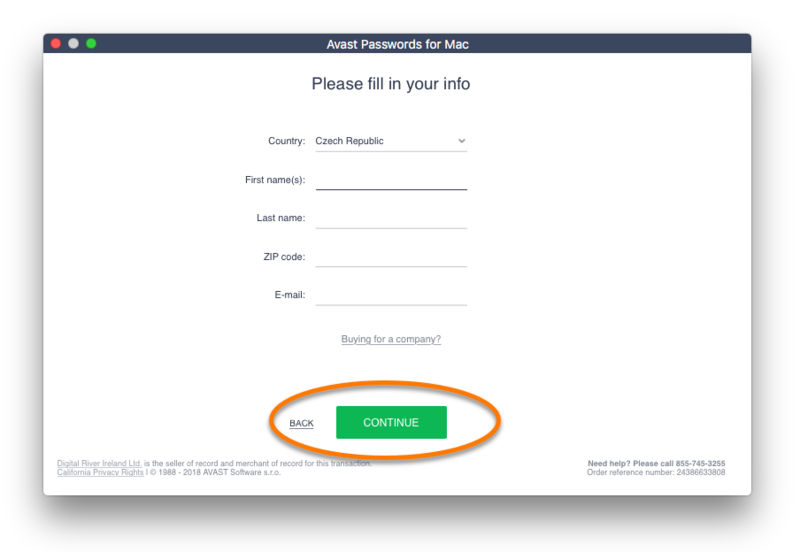 Click the password generator icon on the left-side panel, then set your parameters for a safe password. 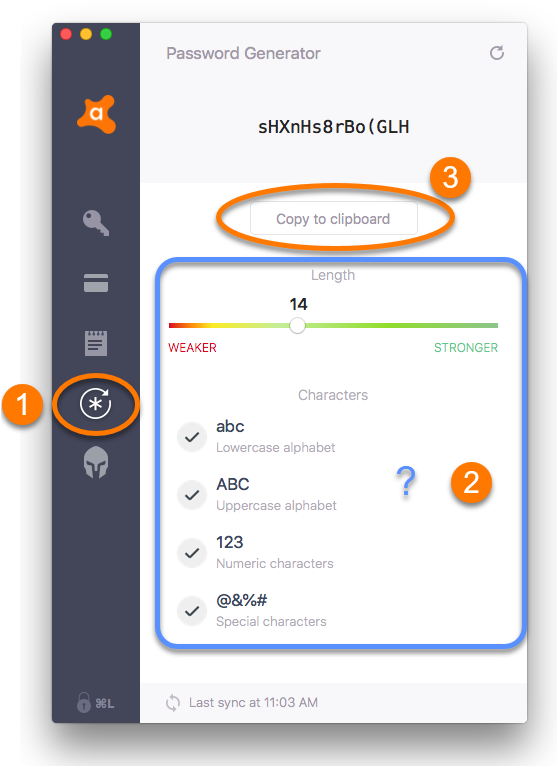 Once a safe password is created, you can copy it by clicking Copy to clipboard. 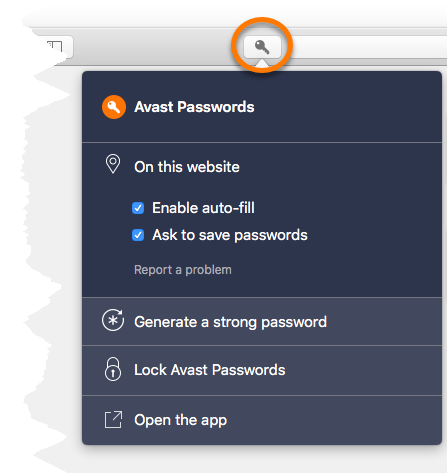 It is also possible to generate a safe password from the Avast Passwords browser extension menu. 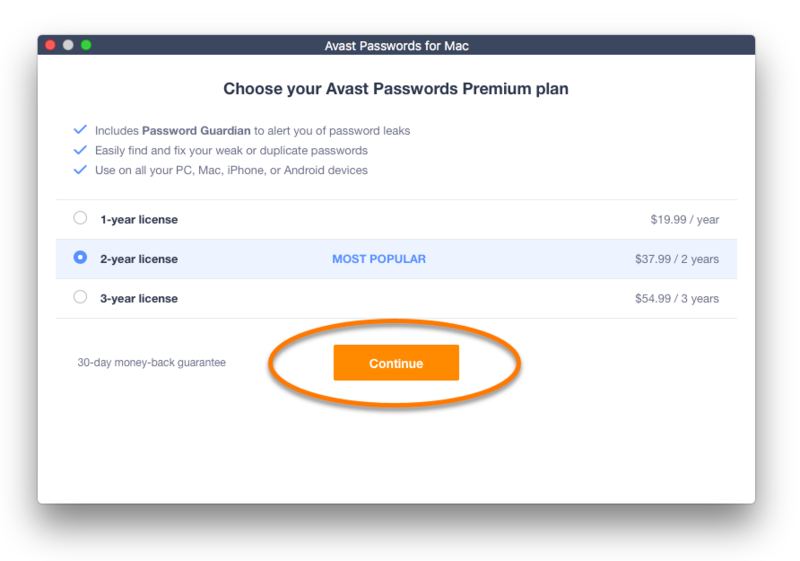 Password Guardian is a paid feature of Avast Passwords. Password Guardian monitors the internet and notifies you if it finds that any of your passwords have been leaked online. 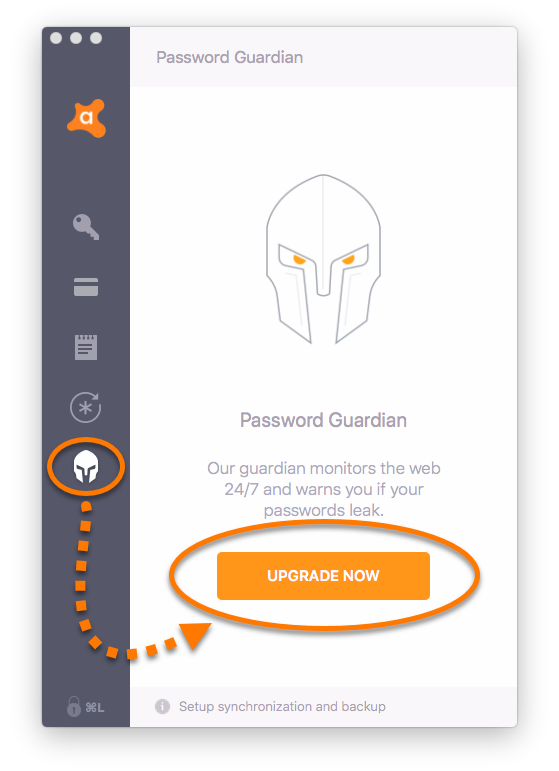 Click the Password Guardian icon on the left-side panel, then click Upgrade Now. Select your preferred plan and click Continue. 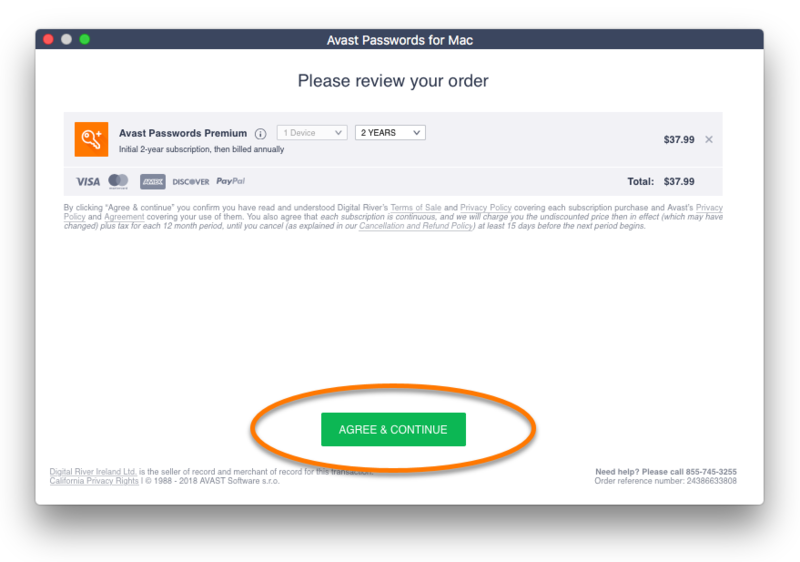 Review your order details, then click Agree & Continue. Follow the on-screen instructions to complete the purchase. 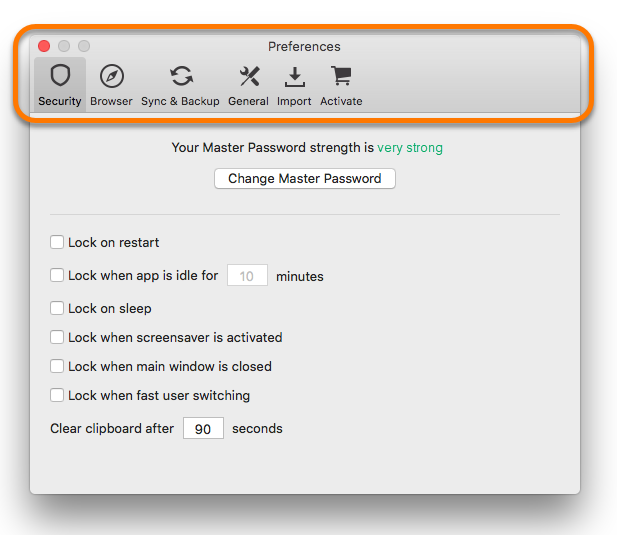 Click Avast Passwords on the menu bar and select Preferences. 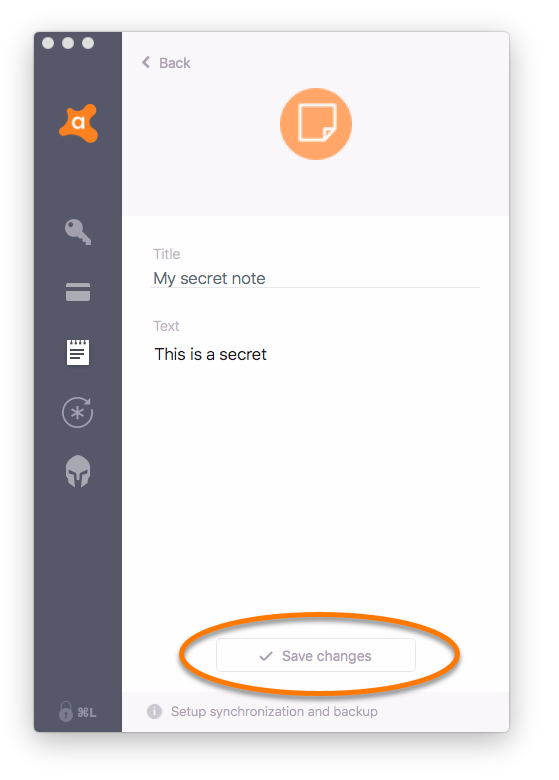 Select Activate from the menu panel, then click either Enter Activation Code or Log in with Avast Account and follow the onscreen instructions. On this website: adjust these options for the currently opened website. 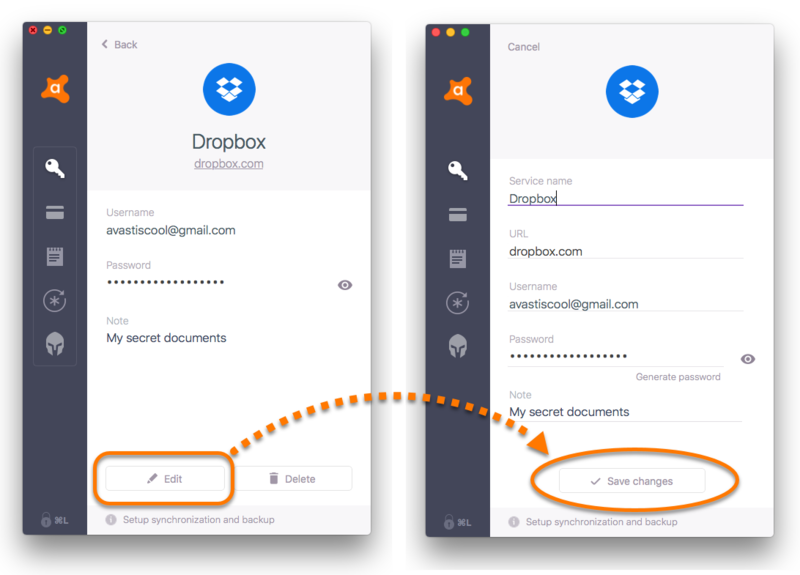 Enable auto-fill: enables Passwords to fill in your login details automatically based on the accounts that are stored in your Passwords vault. Ask to save passwords: if Passwords does not already contain account details for this website, then Passwords offers to save your account details. Generate a strong password: generates a safe password and allows you to copy it. Lock Avast Passwords: locks your Passwords vault. Open the app: opens Avast Passwords. 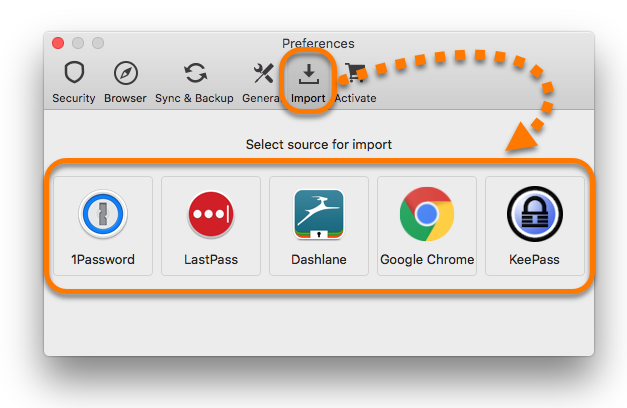 Select Import from the menu panel, then click a browser or another password manager icon to start importing your data. Follow the on-screen instructions to complete the process. 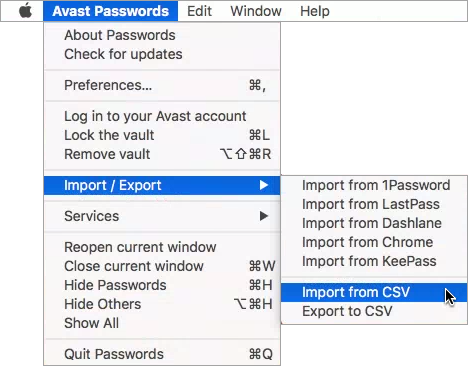 If you want to import your login details from another password manager that is not visible in the Avast Passwords window, you can import your data by using a CSV file. 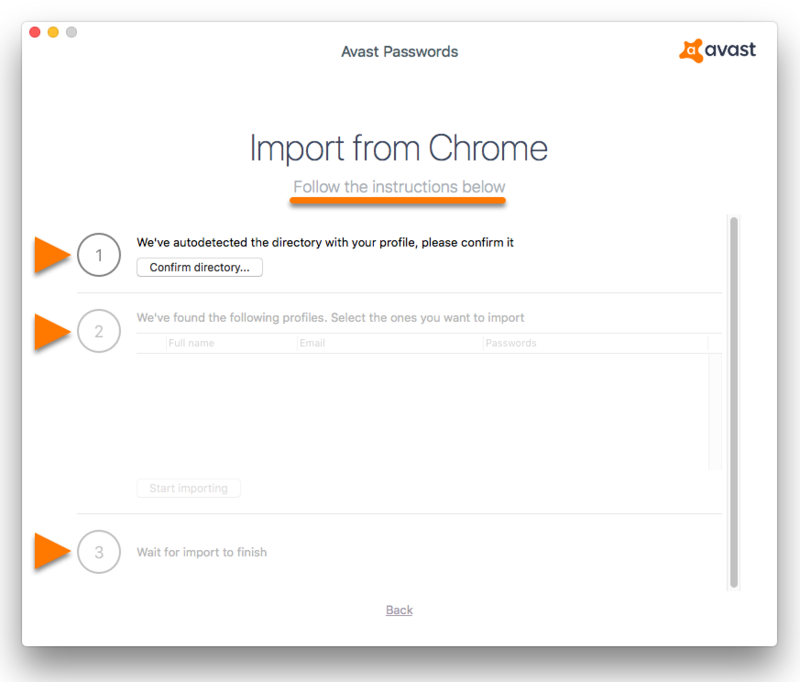 To import a CSV file to Avast Passwords, click Avast Passwords on the menu bar and select Import / Export. Then click Import from CSV and locate the CSV file you want to import. Follow the on-screen instructions to complete the import. 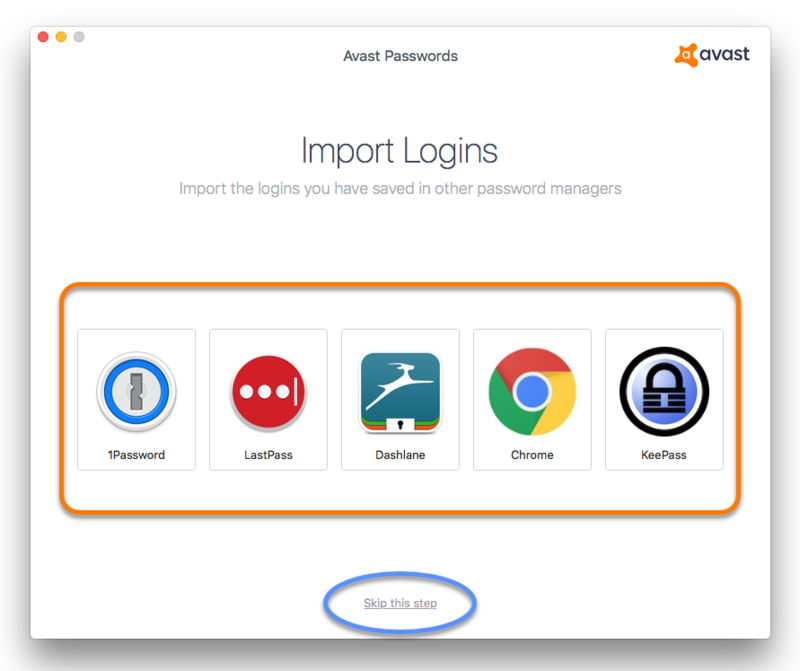 To manage your Avast Passwords settings, click Avast Passwords on the menu bar and select Preferences. Then select a tab from the menu panel to configure its settings. Security: specify how often your Master Password is required, or change your Master Password. 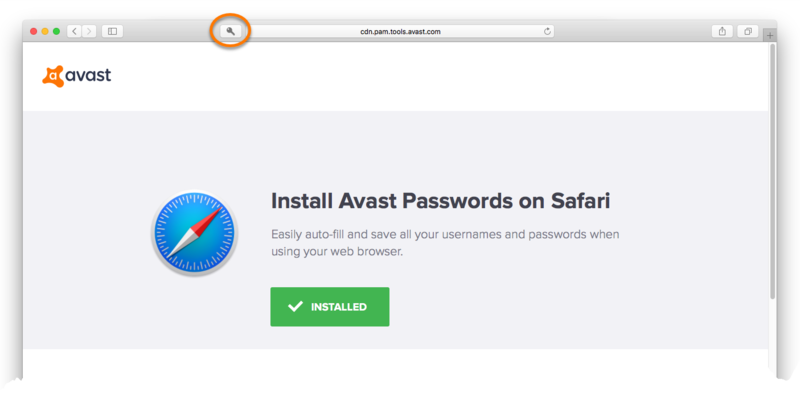 Browser: install the Avast Passwords browser extension in your internet browsers. 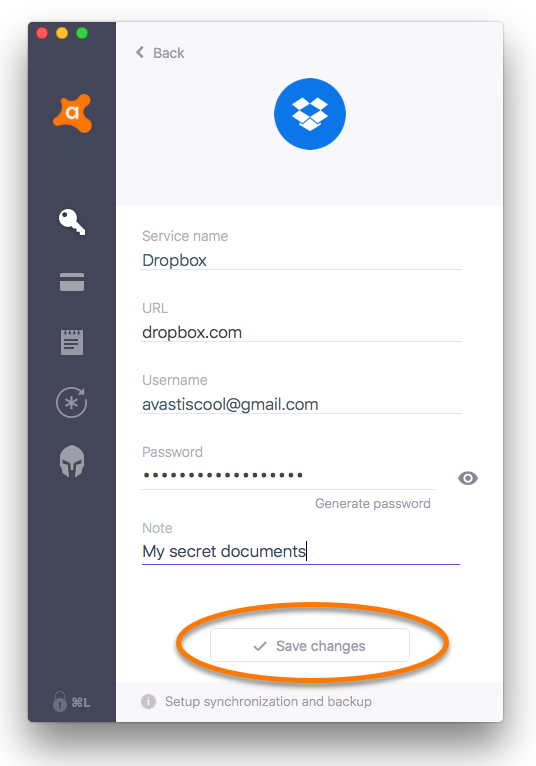 Sync & Backup: synchronize the data stored in Avast Passwords across all of your devices. General: check for updates and participate in beta testing. 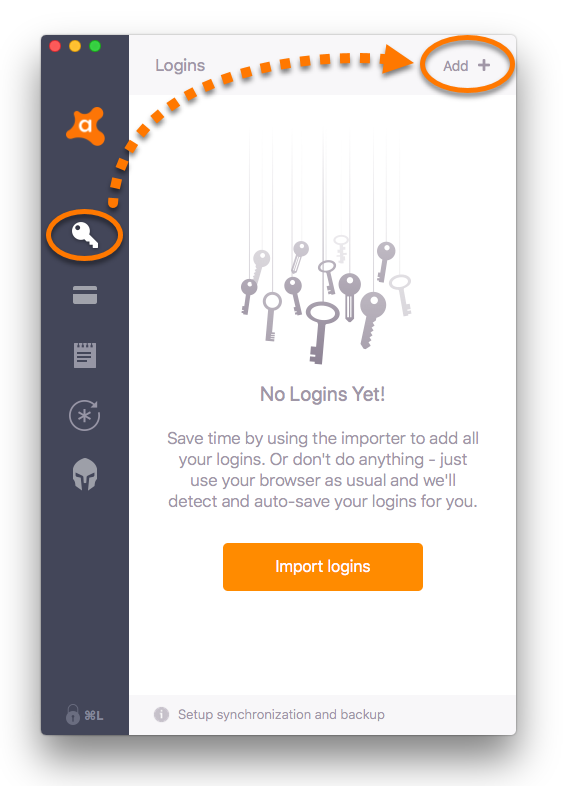 Import: import your login details from your browsers and other password managers. 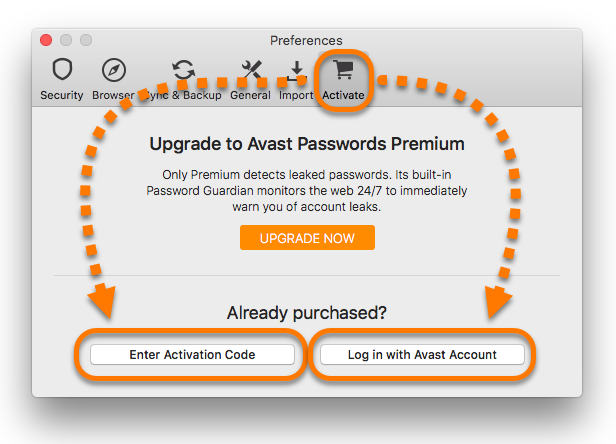 Activate: upgrade to Avast Passwords Premium.